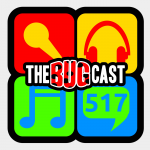 the bugcast 516 – Lions and tigers and bears, oh my! This week on The Bugcast: we look at safety education for pre-schoolers, we yarn about the new Jurassic World film we’re going to see tomorrow, and we play 8 cracking tracks of Creative Commons music! The next show will be episode 518, which will be streamed live in the chatroom on Friday 15 June 2018 at 21:30-ish UK time (BST/GDT/UTC+1).